Knorr® Selects™ sides are made without any artificial flavors or preservatives, and are gluten free! Our savory Four Cheese Risotto expertly blends rice with asiago, parmesan, Romano and cheddar cheeses into a deliciously creamy risotto-style rice dish. Four Cheese Risotto is rated 4.2 out of 5 by 910. Rated 4 out of 5 by berna_ca_16370004 from Knorr Selects I redeemed my Knorrs Select coupon at Walmart. I was already aware of the Knorr brand, but not of this product. i like using the Knorr brand soup base for it's flavor and price point. I said that I would occasionally purchase this because it was quick and tasted good. But it was hard to find at other grocery stores. I don't typically shop at Walmart often. I loved the taste and it wasn't over seasoned. Some other brands of instant rice are either too bland or wau over seasoned and you can tell that it wasn't prepared traditionally over a stove. I did not feel the same with this product. I think it was quality and tasteful. It was easy and great price point. Rated 5 out of 5 by emwoody1980 from Best Rice Ever! I am a huge fan of risotto rice, so I was skeptical of a rice that claims to be risotto and can be made in 10 minutes. 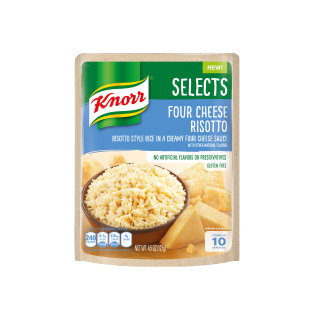 I was very surprised at how delicious the Knorrs selcts four cheese risotto tastes. It was creamy, yet fluffy with a cheesy sauce. I also have a household of picky eaters. I just knew my husband would not be a fan, and he was! He ate it paired with some grilled pork chops. I paired mine with some grilled chicken breasts. My 9 year old daughter just ate it by itself and exclaimed, "Best Rice Ever!". I will defiantly be buying more of this rice for our quick and easy dinners for my family that's always on the go! Great job Knorr! Rated 5 out of 5 by wvumountaineergirl from Like the real thing but so much easier! I LOVE risotto but making it is so time consuming that I usually only eat it at restaurants. This side dish is amazing - the same flavor and creaminess but none of the standing at the stove stirring for half an hour! It does stay creamy as long as you don't overcook it (I did this but when I used some more milk it fixed it). I love cheese so I added a little Parmesan at the end; next time I will probably add some chicken and mushrooms and make it an entree rather than a side dish. It's also great reheated, but again I added some milk as it dried out a little in the fridge. I will absolutely be purchasing this item again. Rated 4 out of 5 by Jaclyn15 from Easy to make! Risotto in under 15 minutes? No way! Yes way! Knorr Selects Four Cheese Rissoto is the easiest way to make fast, tasty rissoto, especially on a weekday. Very easy to put together. Cooks for about 10 minutes. Keep stirring, though, so the rice doesn't stick to the bottom of your pan. The only thing I would suggest is the package calls for a 2 minute resting period. It needs at least 5 minutes after you remove it from the heat. After two minutes, mine was still very juicy. After about 5 minutes it was the perfect constancy. The taste? Fabulous! Very delicious! I would definitely recommend this to anyone!